As an entrepreneur, you may have a lot of different business ideas, as well as ideas for new projects, in your head. If you can sell these ideas to colleagues, potential investors and partners, the concept could become your next successful business. A well-designed formal presentation can sell investors on your idea, but before you get to the stage, you'll likely have occasion to provide an elevator pitch. Start with a great hook. It's crucial to attract your audience's attention quickly. The most effective way to do that is to start with a statistic, anecdote, compelling quote or question that frames the conversation you want to have. Your hook should steer your discussion towards your most enticing variables that tees up your topic but leaves your listeners wanting more. Structure your value proposition. Once you've delivered the hook, jump into the details by specifying the problem your business will solve. Work to connect your idea to real-life pain points the people you are speaking with experience by tailoring them to their everyday activities, hobbies or their profession. Have qualitative data to back your claims. After you've structured your value proposition, it's time to back your claims with data or statistics to shut down speculation. Choose the numbers you'll use carefully, say them out loud. Are they impactful enough and do they support your value proposition? Spotlight the key differentiators. What makes your business stand out from the crowd? Often it's an improved function or a new approach that solves a problem other businesses also address. Point out what is unique about your idea, product or service. Give the audience a takeaway. If you've delivered an effective elevator pitch, you will want to provide a way for the listeners to learn more. Hand out business cards so listeners can contact you, or end with an invitation to discover more on a fundraising page, website or upcoming event. Don't wing it. Although an elevator pitch should come across as spontaneous, it is still crucial that you practice. Make sure you can recite the hook, amplify the points in a personable way and focus on the right stats. 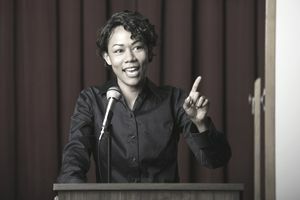 Practice your pitch on colleagues and family to get it right, and allow your excitement to be on display. Don't oversell it. A major mistake plaguing the perfect elevator pitch is overselling the benefits. Words like "disruptive" or "life-changing" can paint your pitch as unrealistic. Don't go too heavy on the data. While it is important to back up your claims, burying listeners with strings of numbers can become distracting. To provide a clear and powerful context, link your data and statistics to the value your business idea delivers. Don't ignore competitors. You don't need to give your audience a roll call of your competitors, but highlighting your differentiators in comparison will help clearly communicate why your service, product or idea is better. Make sure your audience can easily understand why you are different and superior. Don't forget the call to action. Typically informal, your elevator pitch at its core is a sales pitch that requires a call to action. If you wind up your pitch without giving listeners a way to find out more or contact you, you could miss out on significant opportunities. By following these and other proven elevator pitch tips, you can create a pitch that immediately captures listeners' attention, tells how your business addresses their pain points, provides data to support your claims, highlights how your product is unique and gives listeners a way to find out more. Remember to keep your pitch natural, but don't be afraid to let your excitement shine through. If you can do that, you'll be well on your way to creating a groundswell of support for product and business development. Nicole Lininger, Director of Corporate Communications at InventHelp, a leading inventor service company since 1984.